B. We have two questions for which we can only surmise answers. a. The Bible gives us no further answers. b. However, most believe that he was a Levite since his son was given charge of the ark. 2. Why wasn’t the ark taken back to Shiloh and placed in the tabernacle? a. Again, the Word of God does not give us information about this. b. It may have been a form of retribution upon the leaders in Shiloh for having allowed the ark to be taken from the tabernacle. …and sanctified Eleazar his son to keep the ark of the Lord. c. NOTE: It would be interesting to know exactly what Eleazar did from day to day as he attended to the ark. B. 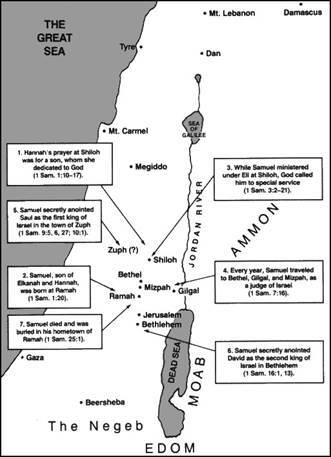 This would put us well into the reign of Saul as king over Israel. …and all the house of Israel lamented after the Lord. A. One explanation is that the separation of the ark from the tabernacle would cause difficulties for the children of Israel, especially during the feast days. 1. It would be especially problematic during the Day of Atonement. 2. Because of the separation the children of Israel lamented. B. Others believe they lamented because they were still under the oppression of the Philistines. A. To put away the strange gods and Ashtaroth and serve only God. B. It seems that Samuel had been a prophet and a priest up to this point in time (See I Sam. 3:20), but he had not assumed the position of judge. 1. The people had descended into their worship of idols and departure from God. 2. When he did step into the role of a judge, he immediately began to cleanse the nation of idols. b. This was a fertility goddess. 2. This is the supreme male god of the Phoenicians. C. Clarke: “These were not two particular deities, but two general idols; the one masculine, Baalim; the other feminine, Ashtaroth; both the words are in the plural number, and signify all their gods and goddesses” (e-sword). b. An old sacred place in Benjamin (Josh. 18:26). A. The pouring out of the water seems to indicate their repentance, a picture of the pouring out of their hearts before God. B. Fasting shows one’s dependence upon God. …and said there, We have sinned against the Lord. And Samuel judged the children of Israel in Mizpeh. A. The children of Israel acknowledged their sins. B. This was a verbal confession of their wrongs to God. Confession exposes the sin and makes repentance an easier act (Prov. 28:13). A. They went up to do battle against Israel. B. When Israel came to Mizpeh, some believe it was to do battle with the Philistines. Remember, Samuel had told them that if they would turn from their idols and serve God, the Lord would deliver them out of the hand of the Philistines (I Sam. 7:3). Thus, the Philistines were responding to the actions of Israel. C. The response of Israel negates this view, however. 16. What was the emotional reaction that Israel had when they heard about the Philistines? (I Sam. 7:7). And when the children of Israel heard it, they were afraid of the Philistines. B. If the children of Israel gathered at Mizpeh to do battle, why would their hearts be afraid when the Philistines showed up? A. Cease not to cry unto the Lord our God for us. B. “They had strong confidence in the intercession of Samuel, because they knew he was a holy man of God” (Clarke, e-sword). C. NOTE: This is not the action they had taken in their last battle with the Philistines. They did not consult the Lord at all. They devised their own plan to attempt to defeat their enemy. B. The only other time this type of lamb is mentioned in Scripture is in Isaiah 65:25. C. This suckling lamb was at least 8 days old as required by the law (Lev. 22:27). D. “For the burnt-offering represented the man, who consecrated therein his life and labour to the Lord. The sacrifice was the substratum for prayer” (Keil & Delitzsch, e-sword). …And Samuel cried unto the Lord for Israel; and the Lord heard him. B. Israel had approached God in the correct manner this time and God heard their cries through this man of God. A. He thundered a “great thunder” upon them. …and discomfited them; and they were smitten before Israel. And the men of Israel went out of Mizpeh, and pursued the Philistines, and smote them, until they came to Beth-car. A. They pursued them to Beth-car. A. He placed it between Mizpeh and Shen. …and called the name of it Eben-ezer, saying Hitherto hath the Lord helped us. 1. The writer indicates his knowledge of this event in the book of I Samuel. 2. He notes that God still helps His people. B. It is interesting how easily God defeated the Philistines. This could have been done the first time Israel when to battle with their enemies if only they had asked counsel of God. …and the hand of the Lord was against the Philistines all the days of Samuel. A. All the days of Samuel. B. This would indicate all of the days of Samuel’s rule as judge. Once Saul became king, he was then in conflict with the Philistines on a regular basis. 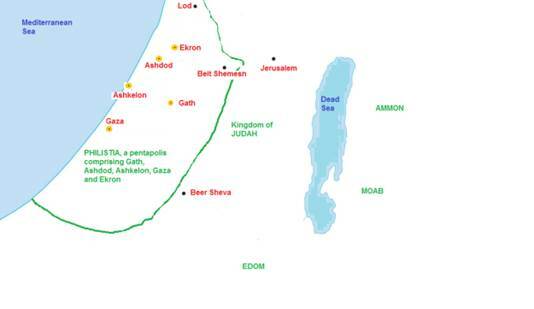 And the cities which the Philistines had taken from Israel from Ekron even unto Gath; and the coasts thereof did Israel deliver out of the hands of the Philistines. A. All of the cities form Ekron unto Gath. 29. 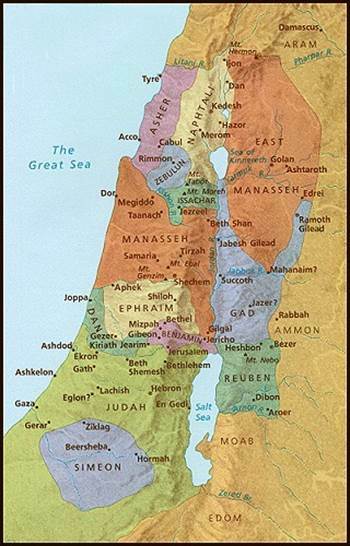 “And there was peace between Israel and the Amorites” (I Sam. 7:14). B. This involves his civil capacity and not his military leadership once Saul was made king. B. The meaning of Ramah is “hill.” It is located about 5 miles northwest of Jerusalem. …and there he built an altar unto the Lord. B. Think about what has happened to the holy things up to this point. 1. The tabernacle is still in Shiloh. 2. The ark of the covenant is in Kirjath-jearim. 3. The altar for sacrifice is now in Ramah. a. NOTE: Some believe that Samuel may have moved the tabernacle to Shiloh at this time, but there is no record of it. They say this because of Samuel’s close connection to the tabernacle in his formative years. b. God will one day declare exactly where he wants the tabernacle and the ark of God put. 17. “Now therefore hearken unto their voice: howbeit ________________ solemnly unto them” (I Sam. 8:9).